BLOCKBUSTER VIDEO! 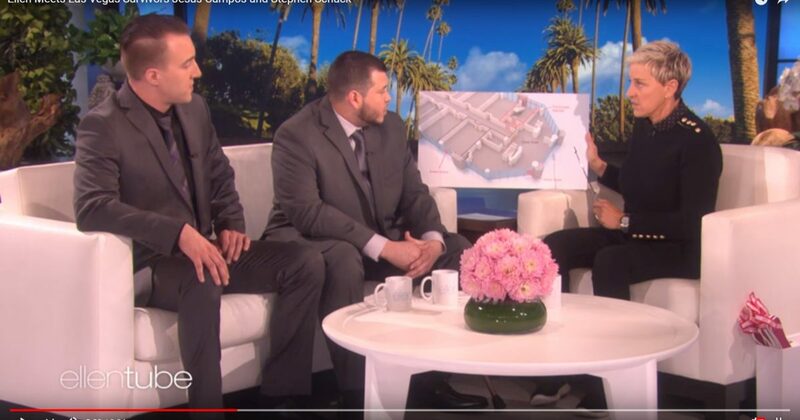 Jesus Campos finally surfaces to give his first and only interview to Ellen Degeneres, which looks like one big scripted lie after another! Jesus Campos surfaces to tell his story, but he really tells NO story. He only told what appeared to be a very scripted account. Campos chose as his first, and according to Campos himself, his ONLY interview on the events of that fateful night on the 32nd floor of the Mandalay Bay Hotel, Ellen Degeneres. Why? Why didn’t Campos honor his prior commitment to speak with Sean Hannity? Not only did Campos blow off Hannity of Fox News and four other media outlets, he disappeared just prior to his initial press conference and was MIA for several days, apparently being coached. My opinion. That isn’t what he said, Ellen. He said he heard what sounded like drilling sounds. He never said anything about hearing gunshots that he mistook for drilling sounds. As a country boy, hunter and old soldier, I have heard a lot of “gunshots.” As a career building contractor, I have heard a lot of drills. I have never heard any “gunshots” that sounded like “drilling sounds.” I’ve never heard any rifle that sounds like a drill. What made Ellen try to plant that idea? Was she instructed to? Is someone trying to engineer the narrative that the assault on the concert was already underway when Campos was shot? Surely seems that way. Then, Campos says he never told dispatch that he had been shot because he “wanted to clear that radio traffic so they could coordinate the rest of the call,” (3:00 mark) whatever that means. That has to be BS. A guard who has just been shot radios into dispatch informing them that there is an active shooter in the building but doesn’t mention that he is laying on the floor with a bullet in his leg and can’t walk? Really? There must be no recording or verifiable proof otherwise or this ridiculous tale would not be part of the official narrative. The important thing to take from this is the fact that Campos had obviously been coached to tell the world that he never told dispatch or anyone else that he had been wounded. Why? Liability on the part of Mandalay Bay, obviously. Bottom line: It looks like the entire Ellen interview was scripted to conceal the truth and drive home a false narrative. Hannity would never have done that. Sean would have asked the tough questions that Ellen did not ask, like, “How long were you in the hallway, wounded, when you heard Paddock open fire on the concert?” and “Do you mean to tell me that you didn’t take the one second it would have taken to even mention to dispatch that you had been shot? and “Why were police in the building just outside Paddock’s door doing nothing while he was killing innocent people?” and “Why did police wait until an hour after Paddock had killed himself to break into the room?” Very important questions that Ellen never asked. My guess is she was told not to ask those questions and that is why she was granted the exclusive interview, the one and only interview that Campos intends to participate in, obviously under the direct orders of someone. The only thing that is certain so far in the Vegas mass murder is that almost nothing is certain, except that 58 lives were lost and over 500 people were wounded while apparently police gathered in the hallway on the 32nd floor listening to Stephen Paddock shoot hundreds of innocent people. Why didn’t the police storm the room? Sure, Paddock may have wounded one or two (they were wearing body armor to protect their vital organs). He may have even killed one with a lucky shot. But hundreds of people would have been saved. Why didn’t police evacuate the adjacent rooms, use one room next door as an assault point, and fire through the wall until they killed or disabled Campos? I think that would have been my favored tactical option. Again, no real answers, just more questions.